Grief and loss are not the end of the road.Gifts found along life’s way can make it abundantly worth living, as this couple discovered on the ultimate road trip. A lot of us wouldn’t label ourselves “RVers”, but when my wife and I were contemplating a year long trip, it quickly become apparent that rv travel was the only way to go. Rv travel in America, in particular, with its wide array of campgrounds, provides what many people think is the best of all possible worlds. Look at it this way: With rv travel, you’re on the road every day (but only if you want to be), poking into places you’ve thus far only dreamed about. Each day is a potential adventure. Each day offers up new and unexpected things, unanticipated discoveries. Yet with rv travel, each evening you’re eating at your own table, if you wish, and sleeping in your own bed. You can eat out if you want, and occasionally you may. You can rent a room if the spirit moves you, but it won’t. The great thing about rv travel is that you’re at home and away at the same time! Rv travel allows you to pursue adventures into unknown places and also paradoxically allows you to do so in the comfort of a familiar environment. Bottom line, rv travel guarantees a trip of a lifetime! 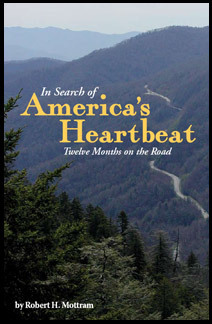 I know first hand the ins and outs of rv travel, so feel free to check out my website and book, In Search Of America’s Heartbeat:Twelve Months on the Road for helpful tips and expert guidance to ensure your rv travel is heading in the right direction! RV Park Info on Every State! Click on the state for info.